Sometimes a cuttlefish wants to cuddle, and sometimes it wants to attack you with its face and ingest you whole. Both sides of the cephalopod's personality are on display in this video from the BBC. 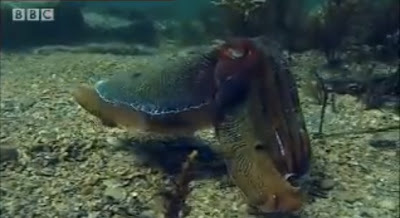 Also on display: the giant cuttlefish's unbelievable full-body strobe light effect. This is an animal you want to stay on the good side of. Thanks for celebrating the 12 Days of Inkfish with me! Next week, regularly scheduled programming will return. Stay tuned for new science and new marveling at nature's old—but spectacular—tricks. Until then, did you miss any of these? I have to admit I'm going to miss these bite-sized snippets of cool science. I enjoyed them very much.